We all have a secret place we only share with the special people in our lives, maybe a secret restaurant in the Cinque Terre, a secret little church somewhere in Val di Chiana, a secret view of old industrial Chicago at a certain time near dusk, a secret konditorei in a little Voralberg town, a secret garden in the Isola del Giglio, a secret foggy little square in London that's still lighted in the nighttime -- dimly -- by gaslight. We all have places and sounds and views that we hold dear to our hearts, that you can't share indiscriminately because the wrong people will just ruin it, somehow, for us too, because those places and sounds and views and flavors somehow seem too delicate -- too magic -- to be there just for anyone, and they're not, oh no they aren't. Alexander Zemlinsky's music is one of those secret places -- its delicate, deep beauty just resonates so much. And the debate's open on when exactly the twentieth century, as far as music is concerned, began -- on the night of "Salome"'s premiere, on the morning nerdy Arnold Schoenberg woke up on the atonal side of the bed, you name it -- what-ever. For Opera Chic the twentieth century was born when Alex met Alma, and everything began. There's a solid argument to be built around the fact that no composer as great as Zemlinsky has had to suffer the same kind of neglect, that no artist as great as poor sad Alexander has been mistreated the way he has had to endure, in the hour of his desperate penniless death and even after it. Every once in a while, a few major conductors -- all men of personal generosity, it's interesting to notice -- give Zemlinsky's music the kind of treatment it deserves: the late wonderful Maestro Sinopoli's concerts, Riccardo Chailly's and our James Conlon's recordings of Zemlinsky's works. Still, his music remains somewhat obscure, his name almost always absent from most playbills of important orchestras. Therefore, whenever Zemlinsky is played, it's a good day for classical music. We just spent a Friday night with the New York Philharmonic, and while Gilbert is away, the Phils play -- and they play Zemlinsky. In a concert that was originally supposed to herald Count Vlad Jurowski's New York debut, the young Russian conductor had mysteriously double-booked himself (he's currently in Torino performing with the Rai Orchestra Sinfonica Nazionale and Radu Lupu). So while Jurowski is in Torino sampling delicious brioche & caffé espresso, Mr. Reliable Neeme Järvi stepped-in to cover the open slot. Not only a new conductor but a new program, too, as Matthias Pintscher's "towards Osiris "got the axe for its U.S. Fall 2009 debut and will premiere instead in March 2010. In a round of 4 nights, Järvi leads a Beethoven, Mozart, Zemlinsky program (ending on Tuesday) with Zemlinsky's Lyric Symphony the headliner...all interconnected via a Prague influence of various and tenuous shades. It opened with Beethoven, the overture of “The Creatures of Prometheus” (shorter version of the Greek myth: you play with matches, you get burned) When Zeus disposed of Prometheus by chaining him to a rock where he was to be eaten alive by an eagle, he might have thought of Järvi's interpretation -- this one literally felt like it was chained to that same eagle-feasting rock. He galloped along at a worthy pace, but in the end was a shallow, tensionless color that barely sparked Beethoven's fire. Next was Mozart's magic Prague Symphony, a half-hour foray by Järvi into soaring, polite Mozart -- the Prague is unique for the three compact movements, shelfing the critical fourth for compositional transitions instead. Järvi's slow and thoughtful tempi wrapped the orchestra in a thick, velvety swath -- an earthbound translation of Mozart's joyful manuscript. Adagio -- Alegro was preoccupied and absent minded, lacking the crackle and good nature of Mozart. Andante and the final Presto was much of the same: Järvi showed mastery of dynamics and pacing, but it never soared nor explored the infinte layers of the score nor captured the exultations of the Mozartian bubble. Although he fizzled and plunked through the first half, Järvi's final Zemlinsky absolved the Estonian conductor of his former transgressions. Järvi's spot-on interpretation of Alexander Zemlinsky's "Lyric Symphony" was the highlight of the evening with its humongous instrumentation and ballZ-to-the-wall soloists. The Lyric Symphony in Seven Songs, after poems by Rabindranath Tagore from The Gardener, in Hans Effenberger’s 1914 German translation is structured in seven interrelated songs for baritone, soprano, and orchestra, running in a succinct, woven pattern without the aid of breaks. The work premiered in Prague for the International Society for Contemporary Music festival in 1924 to which Zemlinsky -- friend of Mahler, teacher to Alban Berg, Anton Webern, and Arnold Schoenberg, the latter later his bro-in-law (ungenerous Schoenberg married Zemlinsky’s sister Mathilde) found great success. The work is greatly evocative of Mahler's Das Lied von der Erde -- Das Lied predates the Lyric Symphony by at least a decade, but still hearkens greatly to Mahler's song cycle masterpiece: both evolve with half a dozen poems; an immense orchestral scoring; two alternating soloists; and are based on texts translated into German. On paper, yes, the two are similar, but Zemlinksy's savors a frilly depth with his seven gorgeous songs that soar on a more musical, operatic scale. The transitions are marked with such lovely and ethereal segues, scarily harmonious and intuitive. Colorful expressive passages are tinged with graceful foreshadowing. It's quite obviously a masterpiece of the Twentieth Century, a work of ambition and greatness and awesome power -- incredibly, the New York Philharmonic had only played it once before, in 1979 under the baton of James Levine. Thirty years later, Swedish soprano Hillevi Martinpelto and our dear booming hulking self-loving American baritone Thomas Hampson were well-matched, never straying far from each other in alternating movements. Hampson's first movement, Ich bin friedlos, demands a deafening baritone entering after a breathless, rumbling, Asiatic-tinged overture. Blooming, billowing vocal lines soared over an intricate, gorgeous composition. Hampson mastered movement III's Du bist die Abendwolke with an introspective, melodic and thoroughly modern interpretation. Swedish soprano Hillevi Martinpelto exercised a fabulous, solid voice, well-suited against both Hampson's professionalism and Lieder's stringent demands. Her first solo via Mutter, der junge Prinz was musical and muscled, but not overbearing. The music, as it is often the case with Alex's work, just shimmered there, in its greatness, not flaunting its beauty but simply allowing it to illuminate the night. Come for Zemlinsky and stay for Zemlinsky -- this is a rare treat. If you're heading to any of the New York Philharmonic's Concerts in the Parks performances this summer, chances are that you'll sample the maestrolicious skillz of Xian Zhang. The New York Phil's Concert in the Parks kicks off this Tuesday, June 24, with selections from Shostakovich, Mendelssohn, Tchaikovsky, and, uhhhh, Sousa; Sousa, which can only mean one thing: FIARWAHKS! YAY! Grucci [not Gucci] fireworks after the show! Also this year for the opening performance, the New York Phil gets interactive, and by sending a txt/sms to 72648 (with code "NYPHIL") before the intermission, you will be able to vote for a final encore from two selections -- although the "chicken or fish" option is top secret for now. Anyway, as we were saying before we got distracted by exploding things: Xian Zhang, the 34-year-old Associate Conductor of the New York Philharmonic (since July 2005), came from humble beginnings in a tiny North China village, and went onto formal training at Beijing's Central Conservatory. Recently, she became the first woman to conduct the Staatskapelle Dresden on their home turf. This summer, she will be heading the July 8-July 12 concerts across 4 NYC boroughs and New Jersey. The NY Philharmonic Concerts in the Parks, currently celebrating its 44th consecutive year, ends on July 15th. We're sooo not going to debate the artistic integrity behind mass-marketed, outdoor orchestral performances. Rather, we'd like to highlight Ms. Zhang's make-up for her high-res PR shot. Upon low-res inspection, it's all serious business conductor lady. On blow-up? omg sparkly, glitter-flecked lip gloss! I mean, Oswald Kabasta (whose lips were famously chapped) definitely couldn't pull that off. Rawk on with your pretty pony bonnebell self! 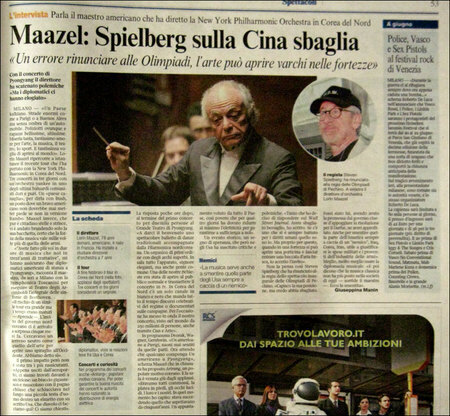 Maazel vs Spielberg: "Wrong To Boycott China"
Maazel is back in the civilized West (i.e. Europe) after his controversial North Korea concert with the NY Philharmonic, and, between performances of his Beethoven cycle this week in Milan at Teatro degli Arcimboldi, is talking to the Italian media. He shared impressions from his NY-Philharmonic-Does-Asia-Tour, and told Milan newspaper Corriere della Sera, in an article printed today, that he believes Steven Spielberg made a mistake by renouncing his involvement in the Beijing Olympics. Spielberg’s mid-February snub to the Beijing Olympics made the news when he withdrew as Artistic Adviser for the opening and closing ceremonies. He slammed China for aiding the Sudanese government via weapons deals, thus perpetuating genocide in Darfur, and dropping the ball in their humanitarian obligations within the international community. Everyone on the side of Sudan applauded Spielberg’s boycott widely, but Maazel wasn't so quick to praise the Hollywood director. Specifically, he said of Spielberg, "It was a mistake for him to renounce the Olympics, as art can open passages in the fortresses". He went on to say, "I understand his position, but I think he made a mistake. Had I been in his shoes, once China's commitment to support the UN resolution for Darfur had been secured, I'd have taken that chance. Also to once again prove wrong that part of America that is constantly hunting for an 'enemy', whether it's Iraq, North Korea, Iran, to be able to justify military budgets and arms sales profits". Better to use musical diplomacy, the interviewer asks? The answer: "They say classical music has no place in contemporary society. This proves them wrong". Gloves off! Maazel, you'll never work in Hollywood again! Hear me?! Curtains! We don't serve your kind! Maazel restates that he has no regrets from accepting the invitation from the North Korean government to represent the first American orchestra to play in the "kafkaesque" country, adding that, "when you have an opportunity in a fortress to open a little door and let enter a gust of fresh air, I will accept it". He had an epiphany after the performance after he saw the reaction of the North Koreans, saying, "They were completely moved, the orchestra patrons were on their feet, and their eyes were glowing. Theirs and ours. In that moment I understood: It had happened like that because they had waited for 50 years. An appointment that the entire country wanted, and like this, the poor of the country had to reduce their intake of electricity for four days to guarantee that there would be sufficient power for us." omg the ny phil prolly couldn't take n e ipods, gameboys, hairdryers, electric toothbrushes, electric razors, cameras, cell phones, laptops...that was prolly the most b00tleg trip ev4r! it's like they went camping! The West-meets-East NY Philharmonic concert in Pyongyang with Maestro Lorin Maazel went off without a hitch, DPRK and USA flags flying on stage in opposite corners to represent each nation. We heard the national anthems of both countries, Prelude to Act III of Lohengrin, Dvorak's Symphony No. 9, George Gershwin's American in Paris, Farandole from Bizet's L'Arlésienne, Suite Number Two, Movement IV, Bernstein's Candide Overture, and Arirang, an old Korean folk song. Maazel addressed the vast crowds in English, while a North Korean translator helped the audience. On ARTE, we were treated to a half time show of a French interview with Zarin Mehta. It looked like 95% of the audience was party directors and of the banker/lawyer contingent, despite Maazel’s wishes as staging, “a concert for the average citizen”. Lorin Maazel gave a brilliant performance with the brassy, upbeat, and sparkling NY Philharmonic. They were the perfect ambassadors, and the performance was impossible to cut up. Maazel's unstoppable. He’s in Seoul on Thursday to close the Asian festival, and then he comes to Milan next week to play the entire Beethoven symphony cycle with the Symphonica Toscanini at Teatro Arcimboldi from March 4th-8th. 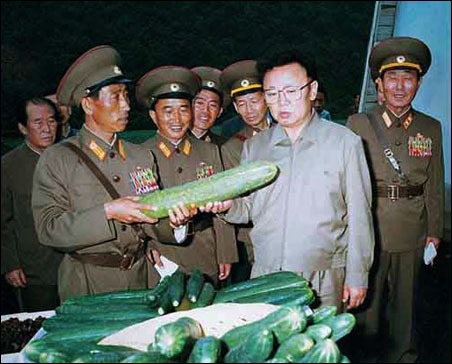 I <3 Pynongyang, The Big Kimchee, The Dictatorship That Never Sleeps. We're sooo tuning into ARTE channel @ 10:00 am when we wake up tomorrow later this evening for the live broadcast of the New York Philharmonic's two hour concert in Pynongyang, DPRK. Starting at 10:00 am (Milan time, bebbe), Maazel will knock the silk socks off of Kim Jong U b illin' and his stormtroopers of death with a concert which will mark the end of a two day musical festival, which we reported here and here and here. Highlights will include the North Korea and USA national anthems, Prelude to Act III of Lohengrin, Dvorak's Symphony No. 9, and Gershwin's An American in Paris. This is gonna be the h0ttest concert north of the demilitarized zone. [Update]: It's like 5 mins after 10:00 am on Feb 26, and ARTE is currently showing some documentary on frikking Russia. WTF ARTE? Pynongyang, I think we have a problem. o hai, it's going to be broadcast l8r 2nite? thx bi! 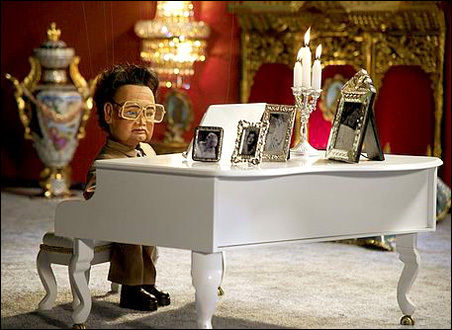 The Opera Chic blog earlier reported on the NYC press conference held by the New York Philharmonic last month, which was held to announce their foray into the Democratic People's Republic of Korea as the first American orchestra to ever make music within the country currently being pwned by Kim Jong-U. B. Illin. The NY Phil orchestra announced yesterday that the culminating concert of their DPRK appearance, which is to be held on February 26, 2008 from the East Pyongyang Grand Theatre (which comes after a two-day musical festival in Pyongyang with Maestro Maazel), will be broadcast live. Oh noes! On High Def?? Free Restylane 4 every1!! All of Europe gets the green light, with the concert streaming on EuroArts and ARTE France (among other providers), while details concerning the USA broadcast will come at a later time. The program will include the North Korea and USA national anthems, Prelude to Act III of Lohengrin, Dvorak's Symphony No. 9, and Gershwin's An American in Paris. This will surely please The Jonger, as according to his official biography, not only was he born on a mountainside under a double rainbow, but he's apparently already gifted the world with the original composition of six operas...that he somehow managed to write in between swigging cognac, fluffling his hair, and polishing his platform orthopedic shoes. Two days ago, the New York Philharmonic held a press conference to announce a new venture within the Democratic People's Republic of Korea: acting as cultural ambassadors, Executive Director Z.Z. 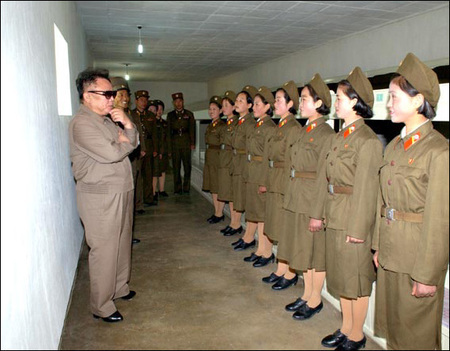 Zarin Mehta will send the NYPhil to the DPRK for a two-day musical festival in the capital Pyongyang, ending with a concert on February 26, 2008 under Maestro Maazel. This will be the first time an American orchestra has ever played in the DPRK, and hope they will act accordingly, wearing shorts, firing semi-automatic weapons, munching on twinkies, popping ritalin, and drinking starbucks frapps as they sit in the pit. And NOW the NYT is all like, "Muti's cool for the NYPhil"; the Internet Goes, Duh! Everybody and their sister now is all like OMG THENEWYORKTIMES ENDORSEDMUTIFORNYPHILCHIEF OMGOMG HESSOKEWL. The Sunday New York Times is now grappling for a piece of the axxion, after Culturegrrl, and the dear Alex "Alessandro Rossi" Ross (he's really Italian, Opera Chic has learned) weighed-in on the subject back in January. Like, three months ago or something (we're not very strong in Math, we spent all the time in class blasting Scarlatti on our headphones and lazily leafing thru import b00tleg copies of Elle South Africa and Japanese Vogue). 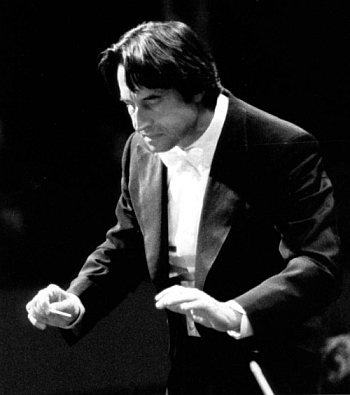 Anyway OC's endorsement stands: Viva Viva il Maestro Muti per la Filarmonica di New York! The New York Philharmonic has yesterday announced their 2007-08 season. The new season is loaded with Maazel, Dohnányi's Beethoven's Fifth (Oct 2007), Barbara Cook's 80th B'day Party (Nov 2007), Dudamel (Dec 2007), and tons of Muti (appearing in Jan & March 2008). yay & yay. Most interesting? Maazel conducts Tosca in June 2008 with our Radames-playa Walter Fraccaro.